Today I'm linking up for What's New With You? 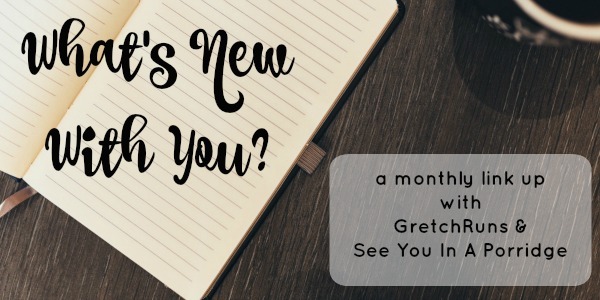 What's new with me? Well, you might have noticed my new blog design! I'm loving the new clean look, and the adorable new cursive font (Bromello, if you're wanting to look it up to download!). I also fixed a glitch on my Bloglovin' page. Thank you to Sarah for pointing out that my posts were not updating on the site (my account had somehow linked to hubby's old webpage from grad school). It's now fully functional again, if you're a Bloglovin' reader! If not, just click below to follow along! It's my new favorite way to keep up-to-date with all the blogs I love. I'm in the process of redoing things that were lost in the change and adding new tabs (like the top one for Recipes). 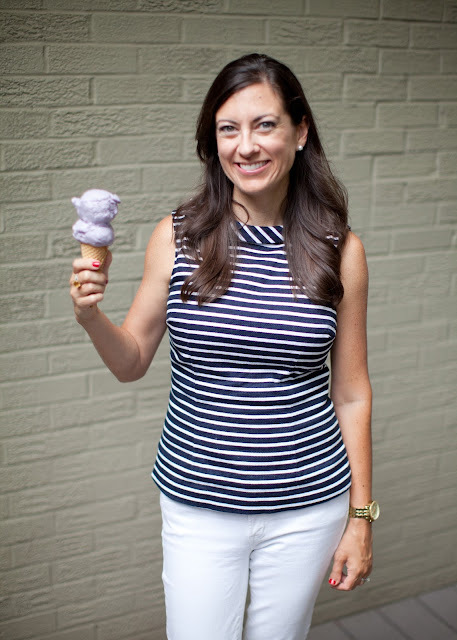 It's like spring cleaning and organizing - but for the blog :) And thank you to husby who was so sweet to snap some photos for my new profile pic - just me and my favorite food! In other What's New news, our little family of three scored 100% on Amazon Echo Jeopardy yesterday! This has never happened before (and probably won't happen again, ha!). If you have an Echo , try asking her to play Jeopardy. It's hilarious. Alex Trebek's voice comes on, then the theme music, the whole bit. It updates with a new set of questions each week, so you'll have lots of opportunities to play. After each game, you'll get a review on how you did ("Better than 60% of players today" if it's a good day, silence if we didn't get any correct). Yesterday's was "You scored in the top 12% of players" - I'll take it! 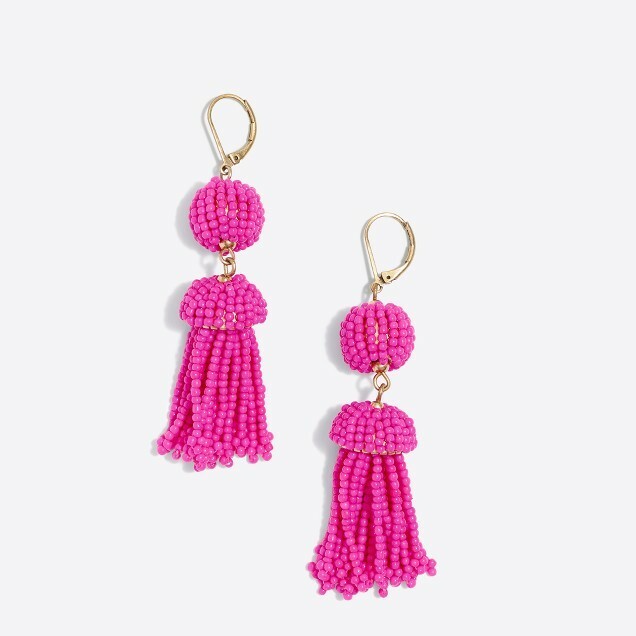 Last, I have these adorable tassel earrings on order from J.Crew Factory right now. I'm a solid daily stud wearer, but dangly earrings are so much fun when getting dressy! Also, I thought they were a close match to these fancy ones, which are more than ten times the cost! Love the new design! Soo sleek and clean. Those Etsy templates are the best! I love your new design! Bromello is my absolute favorite font! I've been using it for all of my Pinterest images and my signature for a while now... I've been toying with the idea of using it for my blog header as well! we don't have an amazon echo thing but if we did, my husband would play jeopardy every single day. those earrings are super cute! i dig the blog design. so simple and classy. nice choice. and that jeopardy thing sounds cool. i don't have an echo, but danged if that's not a nice incentive to get one. I love love love the new design! So pretty and clean! Your new design looks so good!! And yay for getting your bloglovin' fixed! I noticed it pop up last week and assumed you had it fixed!! I love love love the new clean look! I love color too but this is such a fresh design. LOVE your new blog design. I've been wanting to spruce mine up. Those earrings are darling. I've also been wanting a pair of tassel earrings. The size of those look perfect and I'm going to check them out for myself. I am seriously swooning over the new design! I love it! And throws earrings are so pretty. Hope you have an awesome weekend! I love your new blog look. I need to change mine up too! And loving those earrings. I hope you have a great weekend! LOVE the design!! :) Also I am about to go down to my kitchen and play Jeopardy on the Echo! Thanks for the tip! I think you already know I'm a fan of this blog design ;) It's such a good one!! And those pink tassel earrings are adorable- I've had them in my cart too! I love your design!! A nice new look always brightens things up a bit :) Looks great! !